You can remove controls points that you do not intend to use, whether they were automatically generated by the Animated Matte Generator or added manually. NOTEIf you have already animated the Animated Matte Generator, removing a matte point will remove that point on every keyframe, which will affect the shape of the matte throughout the scene. In the Editing Mode panel of the Animated Matte Generator view, select Define Matte Point . In the Camera view, select the point you want to remove. You can select several points by holding Shift while clicking on each point. 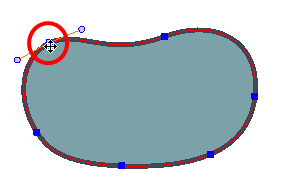 Removing a matte point from one of the matter's contours will also remove its corresponding point to the matte's other contour. It is not possible to have a different amount of points on a matte's inner and outer contours.